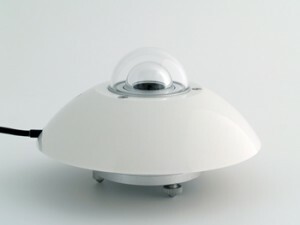 The SR11 is a scientific grade solar radiation sensor. It complies with the "first class" specifications of the latest ISO and WMO standards. The SR11 measures the solar radiation flux that is incident on a plane surface in W/m2 from a 180 degrees field of view (also called "global" solar radiation). Working completely passively, using a thermopile sensor, the SR11 generates a small output voltage proportional to this flux. By employing two glass domes, measurement errors are reduced; in particular thermal offsets. Individual calibration factors are supplied with each instrument. The SR11 can be connected to most commonly used datalogging systems that can read a millivolt input. The SR11 is used for scientific meteorological observations, building physics, climate and solar collector testing. Levelling feet and a level are included. Cable can easily be installed or replaced by the user. Applicable standards are ISO 9060 and 9847, WMO (World Meteorological Organisation), and ASTM E824-94. SR11 can also be used for stability estimations according to EPA ( EPA-454/R-99-005). The SR12 is classified as a First Class solar radiation sensor for Solar Energy Test Applications. It is the first commerically available "off the shelf" product that meets the ISO 9060 First Class performance mandate for solar energy test applications. The SR12 includes an integral temperature sensor for additional quality assurance and a heater to keep dew and frost away and evaporation of deposited rain and snow.